This morning we heard ADP's take on the jobs market; the news wasn't as rosy as many expected but it was acceptable. Specifically, ADP believes the U.S. economy added about 213,000 jobs in January. For reference, the prior reading was 253,000 and analysts were calling for 230,000. In addition to the jobs numbers, we are seeing unstable data in sectors such as manufacturing (ISM for January was reported at 53.5). On a brighter note, personal income ticked slightly higher and the ISM services index moved slightly higher to 56.7. Volatility in crude oil has been shocking, this is despite market participants being groomed in energy market volatility since November. Although the stock market is attempting to disconnect itself from crude oil, there is still a clear correlation. Hopefully the release of the employment report will shift focus away from the chaos that is the commodity markets, to enable the financial markets to focus on the fundamentals at hand. Bond seasonals are bearish, sell non-farm rallies? The latest COT (Commitments of Traders) report issued by the CFTC suggests that speculators remain short Treasury notes. However, oddly...small speculators have now gone long the 30-year bond and are only holding a minimally short position in the notes. You might recall that this group had previously been rather aggressively bearish Treasury notes. Sometimes, when the small trader turns from bearish to bullish it is near the end of a bull market. According to the report, the smart money (large speculators) are holding moderately net long positions in the S&P, and short positions in bonds and notes. The fact that they are holding meager positions leaves plenty of room for them to add to holdings and, thus, could be a sign of underlying strength in stock indices and the opposite in low yielding Treasuries. February bond seasonals are rather bearish. Accordingly, it "should" be difficult for any rallies to be sustained. The bears should be looking for a non-farm rally for potential entry levels. Treasuries are defying gravity, but that is nothing new. Despite a valid attempt at a sell-off early this morning bonds and notes rebounded from session lows. Today's recovery in the face of higher equities suggests the bond market bull has at least one more run left in it. We continue to be on the look out for the mid-152s...which is the next potential reversal zone. 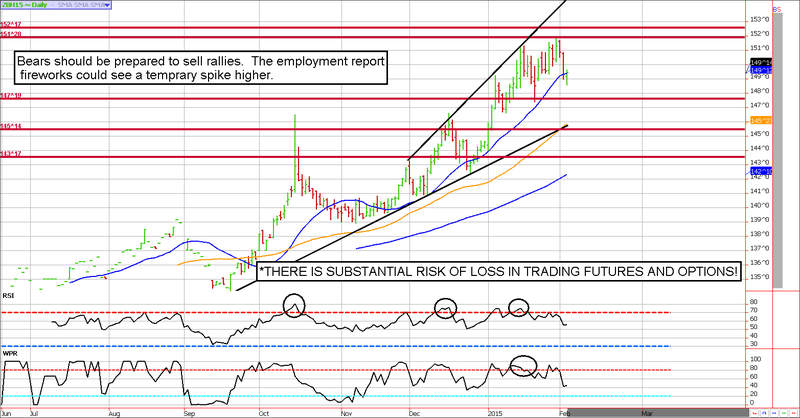 If a reversal is in the cards, it likely won't be possible until we get beyond Friday's non-farm payroll report. Recent data has been relatively optimistic, but there has been a few cracks in the foundation...thus, traders will want to see another month of improved employment. **Consensus:** We can't rule out a ridiculous route to 152'15ish; however, the best trade going forward is likely on the "short" side of the market. Could this be THE top? Long March 138 puts near 20 ticks. February stats are rather mixed despite being within the best six month stretch for the stock market. S&P has been up 8 and down 7 of the previous 15 years with an average change of about -.09%. Central banks around the world are stimulating their economies; overnight China reduced banking capital requirements to free up lending. With this in mind, it seems the Bernanke put has become more of a global put. Thus, we continue to believe the best trades in the ES are from the long side on large dips to support. The December/January time frame has been the first consecutive month decline since April and May of 2012. This stat in itself is rather astonishing; and puts some perspective into this insane rally. In fact, there has been only four occasions in which the S&P has posted back-to-back monthly losses since the 2009 lows. I worry that investors have simply forgotten about the reality of market risk. Nevertheless, I doubt they will be reminded of this valuable lesson right away. As long as prices hold above 1965, the bulls have favorable odds for resuming the rally. The current trading range has been painfully choppy, and treacherous. The swings are large, and more than capable of igniting destructive trader emotions. Monday's low was posted in the low-1970's. It is possible that will be the low of this pattern, but with the payroll report due on Friday we believe the odds are calling for another press lower on, or before, the employment data hits. 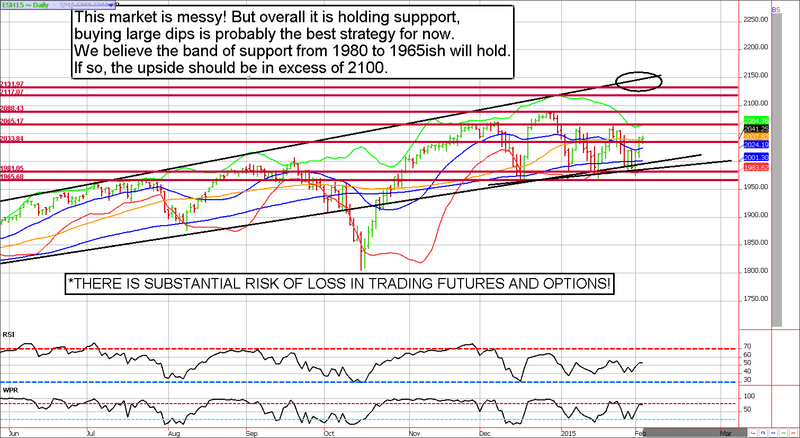 If so, bulls should be on the lookout for 1965ish support. **Consensus:** The chop fest has created several false, and contradicting signals. We believe the best trades will be from the bull side of the trade on large dips to support (1980/1965). September 15 - Buy March 2015 sugar 18.00 calls near 32 ticks. December 19 - Buy the March bond 138 put for 20 (or the 139 put for 25. December 19 - Get long the Aussie Dollar in a small way using e-micro futures. We were buying near .8120 to .8080. January 13 - Buy back March crude 40/58 strangles and sell the March 39/54 strangles using half the quantity to reduce risk. January 14 - Sell March 30-year bond 156 calls for about 30. January 22 - Buy back the March 30-year bond 156 calls to lock in a quick profit ($250 to $300 per contract for most before transaction costs). January 22 - Sell March Euro 109 puts near 34ish. January 23 - Sell March Euro 117 calls near 40 ticks to hedge the existing puts. January 28 - Buy back the March 39/54 strangles, sell April 56/36 strangles. February 3 - Buy back existing April crude oil strangles and replace them with April 42/63 strangles. February 3 - Buy back existing March euro strangles, replace them with short March 111/118.50 strangles. Due to time constraints and our fiduciary duty to put clients first, the charts provided in this newsletter may not reflect the current session data. **Seasonality is already factored into current prices, any references to such does not indicate future market action.